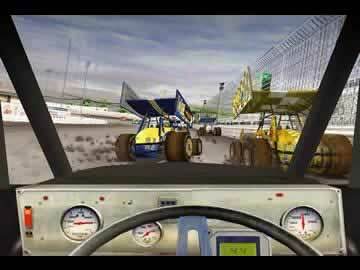 Sprint Cars: Road to Knoxville Game Review - Download and Play Free Version! Option to manage cars, race them, or do both. You can make friends or enemies on the track based on how you race. Dirt tracks challenge even the best drivers to power slide around the track. Network multiplayer allows you to challenge a friend to a race. Even with multiple styles of cars you can only enter one race each week. Limited upgrade options for cars. The Race Track is Yours! Feel the engine rumbling and your heart racing as you whip through the race course and finish first! Bring the excitement of professional car racing right to your computer with tons of races and game modes to play! It's all about developing the perfect power skid to turn left around the oval, dirt courses. Start with simpler cars and work up to faster cars that require intense concentration to make those wild turns. Race on more than 20 tracks, including Dodge City, Williams Grove and even Knoxville Raceway. Start as a nobody in Career Mode and work your way to the top of the ranks by hiring a driver, buying a car and more. Or jump right into racing and choose from Single Races by yourself, Championship Races to beat other drivers' times and a two-player mode. If you're good enough, you can even unlock six crazy racing vehicles like golf carts and dune buggies! If you're looking for some fast-paced fun, this game is for you! Be prepared to work to perfect your turns, grit your teeth as your car speeds at more than 140 miles per hour and experience some crazy crashes. Do you have what it takes to win the championships, or will the other cars leave you in the dust? 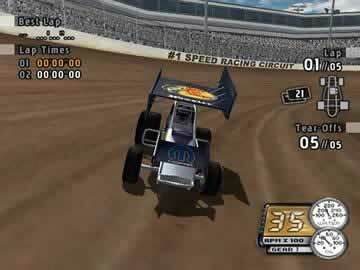 Challenge yourself now with Sprint Cars: Road to Knoxville! Sprint Cars: Knoxville is dirt track racing at its finest. You start with a midget car racer and work your way up to more expensive and more lucrative series such as the modified class racers. Simply managing your racers is also an option in this game if racing is too much excitement for you. If you choose to race your own cars then you'll be power sliding around corners at top speed slinging mud on the poor saps behind you in no time. This game, like most racing games, has several modes of play. Arcade mode allows you to pick races you wish to race on and cuts out all the prep work necessary in the career mode. If you have ever dreamed of winning a professional racing trophy, then career mode is for you. In career mode you are the manager and if you want, the driver. As the manager you will be making all the decisions such as which sponsors to use, what drivers to hire and even which races you want to enter. The game also has many more decisions you will be making along the path to the trophy. Like in real life, earning money to pay your drivers and upgrade your racers is an essential part of the game. The level of detail in this game is astounding. For instance, if you get too close to the racer in front of you, your screen becomes caked in mud. Fortunately the game also includes “tear offs”, a thin plastic sheet placed on your window for quick cleaning. 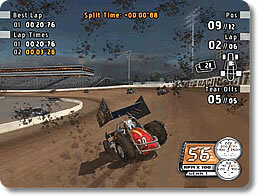 Many real life racing skills are utilized in Sprint Cars: Knoxville like power sliding and drafting. Drifting or power sliding around corners is one of the skills you must learn to become one of the top racers in this game. Drafting, used commonly in NASCAR style events, involves driving impossibly close behind your opponent to reduce drag and gain enough speed to pass. Bumping is allowed but be careful not to bump too much because your opponents know how to hold a grudge. If you anger a fellow racer the next time they get a chance, they will put you into a wall without thinking twice about it. In addition to the gameplay detail the graphics are amazingly well done, adding to the game experience. The drawbacks to this game are relatively minor but do present some problems. There is a relatively small amount of cars to choose from and the upgrade options are limited to a few simple choices. This could cause you to become bored with your racer but luckily there are two other classes of racer to move on to. Another problem exists if you just want to manage your race team and leave the driving to the drivers. Each week you can only enter one race event so having multiple types of cars becomes pointless. You can enter up to two cars in a single event but you can only participate in that one event. This makes building your fortune that much slower. The number of laps in each event can become tiresome, with the qualifying heats and final race you can end up running in the range of 50 laps on each track. On an oval track 50 laps can be pretty dull if your ahead by two or three laps. Conclusion - Get Behind the Wheel! Through intricate racing detail, both on the track and off, Sprint Cars: Knoxville creates a unique racing experience. Allowing you to do as much, or as little racing as you like opens this game to more than just the racing fans. The few minor drawbacks are pale in comparison to this game's awesome racing experience. Whether you want to hold the trophy in your hand or just build a racing empire, Sprint Cars: Knoxville is the game for you. Watch an advertisement highlighting the various cars and tracks which you can race within this intense racing simulation.